Contract Details: Two Year initial contract. Yearly Appearances & Goals: 2012/13: 23 (1), 2013/14: 31 (4). Highlight: He became the first ever Wanderer to gain a national team call-up, and made his Socceroos debut on the 7th of December 2012 against Guam, scoring a free-kick as well. He followed this days later by scoring again from a free-kick against Taiwan. 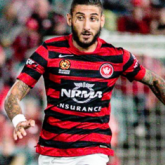 Highlight: Scored his first ever goal for the Wanderers, against Perth Glory in Round 22, Season 2012/13 on 23/02/2013. Description: A gifted midfield distributor, Aaron Mooy is a true box to box midfielder, with the ability to play as an alternative to Shinji Ono in the attacking midfield position. Mooy left the club after Season 2013/14 to join Melbourne Heart. These German managers are pretty damn good﻿ aren'﻿t they? I dunno, they are going to finish 60 points behind first place. City also spend approx 15 times the amount Huddersfield do on wages every week. I think Wagner did a pretty good job to keep them up on the lowest budget in the Premier League with a pretty ordinary squad overall. From what I've read on the Terriers forum there should be a considerably larger amount of money available to improve the overall quality of the squad. I think it's a pretty good story anyway for a club that hadn't been at the top level since 1972, and had won three successive league titles in the 1920's to be able to stay up at the top level again. They get a fixed sum from the EPL for staying up don't they ? I believe the prize money in the EPL is fixed by position and recently went up a lot. Huddersfield have done well this year given limited resources. If they hadn't started the season well they would have been relegation material. I can't see much more in the way of funding so it wouldn't surprise if they get relegated next year. I love that: a) Mooy's old man was going nuts with the HT fans; and b) he's wearing a WSW top. I wonder if he is on the move in the next transfer window and to where?? I'd have a guess and say Newcastle but it could be anyone of 8 to 10 clubs at a rough estimate. The betting agencies should start a book on it. Would love to see him at Everton.